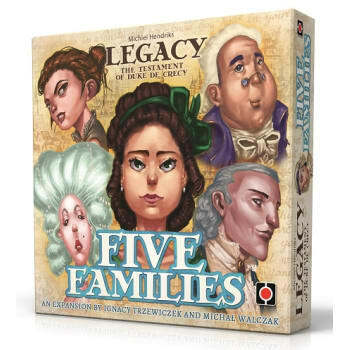 This expansion by designers Ignacy Trzewiczek and Michał Walczak adds a new dimension to Legacy through the introduction of unique Families. 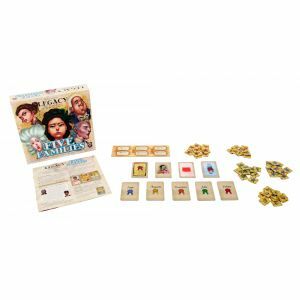 Five Familes allows the players to trade new family members and traits to the other players in exchange for their Favor, a new resource. Favor tokens are used to purchase new, powerful actions. Each family is unique and the individual family members offer powerful abilities to the player willing to trade their Favor. Additionally, Five Families adds new Patrons with unique scoring options, Birth Events with more drama, and a Daisy Track for a new solitaire challenge. This is not a standalone game. 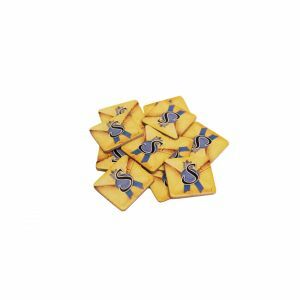 The base set of Legacy: the Testament of Duke de Crecy (any edition) is required to play.